I am writing to thank you all for your professional, compassionate and caring help with my detox. From the first phone call I made 2 months ago, to the Jeanne I wonder if really exists? (I think she’s the Genie in the lamp) I was put at ease and reassured that this Rapid Detox was going to be exactly what I needed to stop the insane pharmacy roller coaster ride I was on. Jeanne was as helpful and reassuring from the first phone call I made inquiring about the center as she was one week later when I was at home having symptoms I didn’t know how to deal with (even at 10:00 p.m.). Even though I’m not sure where she exists, she’s very real and extremely compassionate. Thank you Jeanne for taking me seriously and helping me just as you promised you would in our first phone conversation. To the doctor: Thank you for being so thorough and taking much time explaining to my sister and me what to expect. Thank you for being accessible and responsive to the after care issues whatever the hour. I would like to thank you for your candid and honest approach to the procedure and more importantly, my recovery plan. Knowing you knew what I was going through helped me to believe that I could truly have a shot at this. Thank you also for walking with me through this process while finding a specialist to take over my case. You have proven to be a person of your word when you said, call me anytime, and I’ll do whatever I can to help. Each time I have experienced difficulties with the slight symptoms I am still experiencing you have been there thoughtfully, thoroughly, in all the hours of the day or night. (I bet you regretted your choice of words when you said, call anytime. Your words and your actions have given me security and sanity during this difficult and exilerating time of being introduced to myself (who I think I kinda like!) I was too numb before to notice. I can only begin to try to communicate my gratitude for your professionalism and the way you all added your own touch to bringing me back to myself. Jonathan, thanks for distracting me with talking about the Seaport, I walk down there every day now, or at least have to drive by it, with brand new eyes. Not only does the quiet still water bring me solitude, but also I truly appreciate every inch my eyes can take in with gratitude, and true appreciation for the history and beauty of this historical and critical piece of my homes history (in my own back yard). I can’t wait to get my kayak in also. To the Paramedics, you made me feel at ease the minute I asked you to use the smaller needle and you did! (Thanks!) Your kind words, sincere gentle care in your approach to walking me through all the preliminaries made me feel like it really was going to be ok. (Sorry for ripping the IV out, that really hurt). It has been about a month now and I feel more alive everyday. Thanks to the staff for tweaking the med protocol to fit my recovery needs. 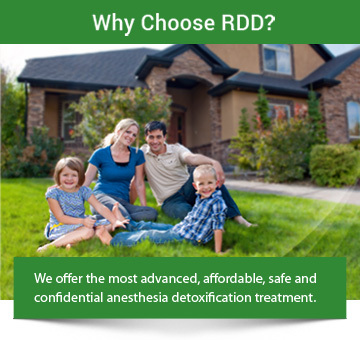 I would and will recommend Rapid Drug Detox Center to any one I know that would benefit from this process of detoxing. I have felt unbelievably well and free from cravings of any narcotics since this procedure and the implant was installed. I will gladly be available to speak to anyone who might have questions for someone who has gone through this procedure. While the healing has been a bit difficult I would do it over again in a minute. Having someone very close to me was instrumental in me being able to focus on all the steps I needed to walk through and I wouldn’t have been able to make thoughtful and conscious choices each step of the way without having my sister there to support and walk me through this. I hope this finds everyone there well and that you all understand the crucial role that all of you have had in my recovery. I can’t thank you all enough. With much gratitude for my New Life.